THE NATURAL HAVEN: Are steamers really worth buying? Are steamers really worth buying? Many of you have asked me to weigh in with some science on the effect of the ever popular hair steamers because they are really not cheap to buy and the question remains, are they worth the investment? Well, it may surprise some of you but there is actually very little research out there including by the companies that make steamers!I have seen it all claimed, from hydrating to strengthening hair but not a single scientific paper to back these claims. The little research that there is on steaming hair is actually from work done in 1934 (ah yes, you read that date correctly, really, *1934). 2. Steaming hair is pretty similar to wetting hair meaning hair absorbs moisture and swells. It can feel smoother as a result of the swelling. 4. Steamed hair will remain elastic provided you use reasonable gradual force and remain under the 30 minutes. 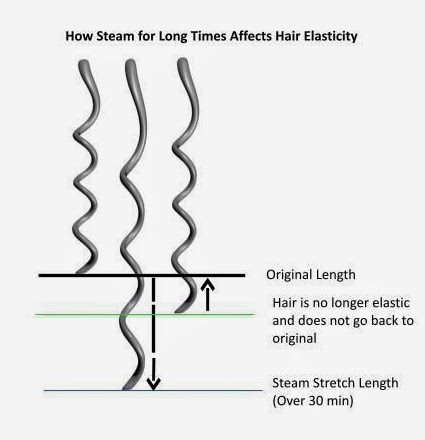 The Long Story - Elasticity is good for you! Since steaming hair is really no different to wetting hair, there is just one juicy tidbit that I could pick out to illustrate. Your natural hair is elastic and you want it to stay elastic. 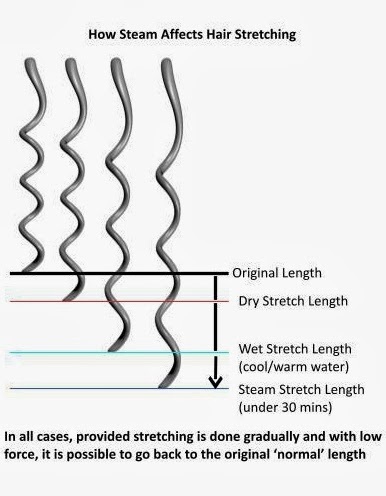 Elasticity means that if you stretch your hair, it should be able to spring back to its original unstretched length. Destroying the elasticity of your hair means that you are weakening it. An internal permanent rearrangement must happen within the cortex to cause it to lose elasticity. What about steaming with hair conditioner? As there is no actual research, my only deduction would be that it would be similar to using warm conditioner except that it would be slightly diluted by the steam. There are benefits to warming up your conditioner, although a steamer would be a pretty expensive choice - cheap and cheerful water bath works for me. Do you own a hair steamer, does it make a difference to your hair, comment and let us know how! My wallet thanks you! Warm conditioners it is for me! I tried a steamer and returned it after one use. My hair felt no different. But my scalp was burned with the hot vapors released. I disliked relaxer due to scalp burns and will not let hot water drip on my scalp. Ouch! Definitely not worth a burn! Yes the point of prepooing with a penetrating oil is to limit the swelling that hair will have when you wet it. If you normally deep condition your hair with heat, steaming should have a similar effect except that the steam will probably dilute the conditioner a little more. I don't really think that it would be counterproductive because if you have shampoo'd and rinsed your hair prior to applying a conditioning treatment, your hair is wet anyway. Pre-pooing will work to limit how much water will go into the hair because there is no complete barrier to water entry into hair. I hope I understood your question, if not, just let me know! Boy are those steamer.manufacturers gonna not like this one. ;-)Your info is sound from where I sit being that we know hydral fatigue is real and it is possible to weaken hair via over conditioning. We also know that excessive or inappropriate heat use can relax aka damage hair. So it makes sense to me that steamers can produce the same results if used inappropriately. I don't find it necessary to own one for myself or my clients. Hooded dryer works just fine to boost conditioning with appropriate products when needed. I always enjoy your findings and take great care to observe the science of hair and ingredients when handling hair. Thanks Amena. I do agree that a hooded dryer may be a better investment than a steamer as a steamer dilutes the conditioner somewhat while a dryer will raise the temperature of the conditioner without the dilution effect. This post is right on time. I've been researching steamers since Christmas and trying to narrow down my options. I told myself this was a better choice than a hooded dryer because I have a handheld one I can always fall back on. But after reading this I think I'll revisit the hooded dryer lol My hair doesn't fully air dry anymore so I have to invest in something. So you have wonderfully backed up why I just put a shower cap on with coconut oil or any form of DC and go about my business with that on, and a hat! And yay to not spending 140-300 on a steamer, I can use that money for other more important things. People managed to deep condition their hair before steamers, my mom used a plastic cap, and a hot towel, and another plastic cap. <--- how is this complicated?!!? Guess I'm too cheap, and I'm okay with that. Been using a hair steamer for 3 years, and it has made a difference on my hair: my hair stays conditioned longer,and I have fewer split ends. An added benefit is that my scalp feels wonderful afterward. The only problem I have is that I want to sleep during the process--it's that relaxing! Time can go by quickly, especially if you have a good book to read,so there's an alarm clock handy. Bottom line--it's been a great investment! I have low porosity 4c hair. The hand steamer really moisturizes my hair to where it's' easier for me to manage. You are the queen of good timing, JC! I just used the method outlined by Trudy of 4CHairchick (it was just on bglhonline) using warm wet towels and double plastic caps for two 15 minute periods. I did it for my 30 minute pre-poo (coconut oil and a pinch of conditioner) and my 30 minute deep conditioner (aubrey organics protein conditioner this week) and I have to say I noticed an increase in softness in my hair and it definitely looked and felt more moisturized. (But it could have also been the protein conditioner which I haven't used in forever). All this is to ask, what is your opinion of steaming with plastic caps and warm wet towels? Is it as beneficial as the warm conditioner bath? or the overpriced hair steamer? Yes I think the warm towels are not really steaming hair but rather using the steam within the towel to transfer the heat to the conditioner and hair. Therefore, they are similar to the effect you would get from a warm conditioner bath or even a hooded dryer. I tried a steamer from a reputable brand that I just had to have after rave reviews from everyone. I was very disappointed with the condition of my 4c after. My hair has always been very very dry and continued to be very dry after using the steamer. I used it several times and each time felt like I wasted more time and energy setting it up and sitting then just deep conditioning my hair with a plastic cap. I ended up giving it to my cousin. I wish I would have invested in hooded dry. Thank you for this post and your always informational blog! very good post, I have been thinking of investing in a steamer...I have fine, thin,low porosity 4C hair. All the pre-pooing, DC with a hooded dryer or thermal cap, overnight with cap and coconut oil is not working. Oh I forgot baggy method( sooner or later the plastic bag must come off) unfortunately I might end up purchasing one or do a 2nd big chop :(...gotta get that moisture in one way...keep up the good posts! I did another big chop last night due to mid strand splits. My hair was wretched. I attribute the damage to steam treatments with a protein conditioner. I wanted to use curlformers so I steamed my DT in (to add moisture) and dried the curlformers under a bonnet dryer. My hair is 4c and was approximately 5 inches long. Two days later I combed through the curls to detangle and re-style. I was aghast at the breakage in my rake comb. What the heck! My hair was literally ragged. I incorporated subsequent protein free moisturizing treatments to no avail. My strands were ravaged by mid strand bubble splits! Seeing the pile of trimmed hair in my sink was liberating last night. I washed my hair and had shrinkage to the nth power. But still I felt free. Just be careful with what product you steam your hair with, and handle steamed hair very carefully. I have to personally say that as someone with low porosity hair, steaming had made a TREMENDOUS difference. There may not be much published info about there related to steam but steam is one of the few ways that us girls with low porosity hair can actually get our hair to "drink up" so to speak because it opens the cuticle layer of the hair. Don't get me wrong, warmed up conditioner is great too and I do that sometimes as well, but steaming really is the best thing. I must say though that I use the steam method from blackhairinformation that doesn't require a steamer. All you use is washcloth saturated in hot water and a shower cap. I've gotten great results from a conditioner that had no ingredients that can build up and I've even done it on naked hair with great results. Where is the proof that steam can relax hair? Please don't be discouraged against hair steamers. I've had mine for 2 years and absolutely love it. It totally enhances my deep conditioner treatments, and adds the bonus of a facial and relaxation. I don't regret my investment at all. I lov(ed) my steamer and thought it was the best investment to date. However, you make a valid point that the steam dilutes the conditioner a bit. I'm now back to using dry heat (use a heat cap) and my hair is responding to conditioning sessions much better. I'm far from any expert on the subject, but in my experience, hair steaming works really well. I have felt first hand that it enhances the effects of oil and conditioners and helps deeply nourish the scalp. I was facing a lot of problems with my scalp and hair since more than a couple years. This resulted in very poor hair quality and even slight balding. I tried a lot of popular things but that didn't help much. I recently started steaming my hair for 10- 15 mins after oiling and the results have been amazing. Problems are gone and I've already regained a lot of my hair back and the quality is also better than ever. My hair are much fuller and strands much thicker now in addition to being softer. By the way, I did not buy any expensive steamer, instead I use a small handheld one which is actually a vapor inhaler for nostrils and may be facial. I have very thick 3b/3c hair and I used a proffesional home hair steamer for about 2 years. I noticed so many BUBBLE SPLITS and mid shaft strand splits that it was not funny. I have stopped using it for about 2.5 years now. I have not cut the bubbles or midstrand splits off, I'm just growing it out. I will never use a steamer again. I don't want to buy a steamer after reading your information. I read that you can get the beneficial effects of steaming your hair by placing a damp wash cloth on your hair, cover with a plastic cap and sit under a dryer or heating cap for 30 minutes. Does that work as well?